Congratulations to FAC’s Development Planning Retreat Raffle Prize Winner! 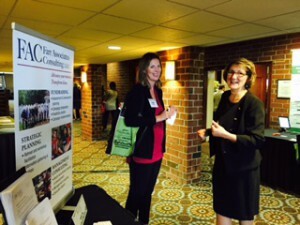 Late September, Judy Barberich and I participated in the 2015 Collaborative Conference, a new joint venture between AFP Central Pennsylvania Chapter, PANO and the Susquehanna Valley Planned Giving Council. More than 300 participants came together to share resources and tools that aim for community impact. For Judy and me, this was our chance to hear the challenges and successes of people transforming lives through their nonprofit organizations across the state. It was also a chance for MMS Advancement Associates to make a contribution that will have impact for one organization right away! For 40 years, the Palmyra Public Library was housed in the Palmyra municipal building. Then in 2014 the municipality began constructing a new building that did not include space for a library. Forced to use money from its reserves to move to a temporary space away from the town center, the Library’s leaders are working on a strategic plan and are considering a capital campaign to address needs for the future. Conference organizers had asked exhibitors to donate raffle prizes that would have impact for winning organizations. We are thrilled that the Palmyra Public Library is the winner of MMS Advancement Associates’ Development Planning Retreat! MMS Advancement Associates LLC works with organizations to set goals and create planning retreats that meet their unique needs. Read a description of a Development Planning Retreat agenda. Contact us today if you would like to discuss your particular situation and how we might help.